Can the reigning champ come back with another chicken dinner? The 860 Evo is the long-awaited successor to the 850 Evo, but SATA bottlenecks mean the two models mostly perform the same. 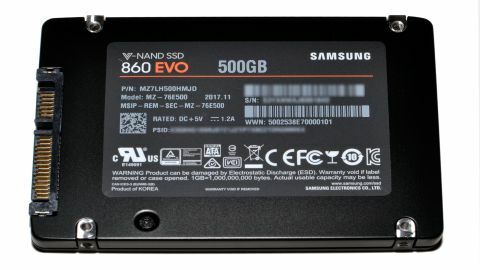 Samsung released its 850 Evo line of SATA SSDs what seems like an eternity ago, back in December 2014. Part of the reason it feels like such a long time is because the drives were so damn good. There were a few firmware updates, which in general slightly improved overall performance, but unlike the previous 840 Evo there were no serious flaws that required immediate fixing. The result is that the 850 Evo has reigned as our overall Best gaming SSD pretty much since it arrived. Something else to point out is how prices improved over time, even with the upward trend in SSD costs starting in mid-2016. The 250GB model launched at $150, and currently sells for around $100, and it's not even the best value. The 500GB model was always the sweet spot, with a launch price of $270. Yes, it was only three years ago that 480-512GB class SSDs routinely sold for well over $200. The 500GB drive bottomed out at $145, and currently has an online price of $165. Given the overall performance and reliability, however, we along with many others have continued to recommend the 850 Evo as the best overall SATA SSD. That means the new 860 Evo has some big shoes to fill. While Samsung initially went after a more budget-friendly price with its 750 Evo line, ultimately it didn't fare so well, and these days the 850 Evo is both faster and more affordable. (The 750 Evo appears to be discontinued, based on prices at several places.) The 860 Evo ends up as the logical successor to the 850 Evo, with similar price targets but improved reliability and higher capacities. The table below shows the key specifications, for Samsung's new 860 Pro and Evo as well as the previous 850 Pro and Evo and 750 Evo. I haven't received any 860 Pro models for testing, though Samsung did provide a 500GB and 4TB model of the 860 Evo. Yeah, that's a big drive, and the added capacity does improve throughput in some cases (I suspect the 1TB and larger models all perform similarly). Pricing also scales substantially if you want such a large SSD, with the 4TB drive carrying a suggested price of $1400. Maybe sometime in the 20s, we'll all be running 4TB SSDs that only cost a few hundred dollars, but it's in the realm of extreme storage for now. The 860 Evo also features Samsung's Intelligent TurboWrite, which uses a portion of the NAND as an SLC buffer. The size of that buffer increases with the capacity of the drive, and Samsung lists both before and after TurboWrite speeds. While both the 250GB and 500GB models drop to 300MB/s after the TurboWrite buffer is filled, the 1TB model can still sustain 500MB/s while the 2TB and 4TB drives can sustain the full 550MB/s speed (for sequential data). The 860 Evo is also available in M.2 SATA and mSATA formats, if you don't want a 2.5-inch drive. The performance won't be any better (or worse), and the maximum capacity is lower—2TB for M.2 2280 and 1TB for mSATA—so if you have an older laptop that uses one of those formats, the 860 Evo provides an option for a modern upgrade. The 860 Pro looks the same but with a red square in place of the gray square. The key difference between the Pro and Evo lines is that the Pro series use MLC V-NAND instead of TLC V-NAND, with higher endurance ratings and better sustained write performance. TLC does reduce performance when performing large sustained write workloads, but for most home PCs it shouldn't present a problem. It's interesting that the 860 Pro drops the longer 10-year warranty of the 850 Pro, though it's probably not a huge loss as ten years is a virtual eternity in computer hardware. The bigger deal is the change in endurance ratings. Samsung was very conservative with the 850 series, especially on the larger models. The 4TB 850 Evo for example has the same 300TB endurance rating as the 2TB drive, and the 500GB and 1TB models both have half that at 150TB. For the 860 Evo, the base endurance jumps to 150TB for the 250GB model, and it scales proportionately up through 2400TB for the 4TB drive. The 860 Pro meanwhile doubles the endurance at every capacity, with up to 4.8PB for the 4TB drive. That's impressive, though it's worth noting that Intel's Optane 900P with 3D XPoint still wins easily, with a rating of 10 DWPD (drive writes per day) for five years. That yields an endurance of 5.11PB for the 280GB model, and 8.76PB for the 480GB drive. But Optane 900P is obviously in a different price and performance class, so the comparison isn't entirely fair. Given the target pricing, however, where the 850 Pro made sense at launch for more demanding workloads, these days I recommend moving to an NVMe drive and leaving SATA behind if you're looking for better performance, since even modest NVMe drives often easily beat even the fastest SATA drives. That puts the 860 Pro in a rather niche market. For the performance testing, I've highlighted both 860 Evo models in the charts. In many instances, the two are very close in performance, though there are cases where one drive performs a bit faster. I normally try to stick with SSDs in the 480-525GB range for testing where possible, though in same cases I've only been able to test a larger drive. Note that there are no NVMe drives in the charts. The slowest NVMe SSD I've tested still rates higher in most tests than the fastest SATA drive, thanks to its high sequential read speeds, though the price is also higher. Our Best NVMe SSDs guide shows the overall performance of NVMe drives, and I'll have a new NVMe drive review up later today if you want to see the individual charts. My SSD benchmark suite consists of a mix of theoretical and real-world metrics. Other tests are also run both to condition the drive and to ensure there are no oddities, but for the charts I focus on CrystalDiskMark, IOMeter (mixed read/write performance), file copying, and PCMark 8 Storage. I take the results (in MB/s) from ten of the tests and give each equal weighting (ie, geometric mean) to come up with the aggregate score. While it's impossible for a single number to tell you everything you need to know about an SSD, still it provides a good high-level view of what to expect. The 860 Evo drives are good contenders, with only the 850 Pro and the large 2TB 850 Evo beating the 500GB model in the aggregate score. In the individual test results, however, things aren't quite so cut and dry. Sequential read/write performance looks decent, but heavy sustained random IO falls behind the 850 Evo, sometimes by a wide margin. It's worth noting that the QD1 results are quite good, however, which is where most user workloads end up running. Elsewhere, PCMark 8 favors sequential performance over write speeds, giving the 860 Evo top honors for bandwidth. The real-world file copy test on the other hand has mediocre results. I copy the contents of Batman: Arkham Origins onto the same drive via a PowerShell script—there are about 8,800 files totaling just under 20GiB. This is about as strenuous of a "real-world" workload as most home users and gamers are likely to run, and like IOMeter it shows that there are clearly faster drives. Should you buy an 860 Evo? Overall, the 860 Evo is a good addition to the world of SATA SSDs, though it does feel somewhat unnecessary as performance hasn't changed much from the 850 Evo. It seems more than anything that the new brand is a result of the switch to Samsung's 64-layer V-NAND, a move which I wholly support. Many other manufacturers change NAND without any clear indication that performance also changed, but that's not a problem here. The official launch prices for the 860 Evo feel a bit high, but will hopefully come down as availability improves. Putting more layers in the NAND should reduce costs over time, and it helps bring higher capacities to market. This doesn't inherently make the drive better, but the combination of a refined controller and other firmware tweaks is good. If you're in the market for a new SATA SSD, the 860 Evo takes its place alongside the 850 Evo as a high quality and good performance drive. With the new models now available, the 850 Evo will likely get phased out, and in time the 860 Evo will become the best SATA option from Samsung. Other manufacturers also compete in the SATA space, however, and we'll be looking at one of the more promising contenders soon (Crucial's MX500). Perhaps the best way to put things is that the 860 Evo in most respects is equal or better than its predecessor—a feat that most other manufacturers have been unable to achieve even after three years of trying.